Kelly's Korner: Sleep Tight Sweetheart! Here is what my bedding is going to look like. Only on the bumper - where this has polka dot material - I am going to have a giraffe print (brown and white) and the ties and the trim on the bumper will be lime green. I can't decide if I want to do Harper's monogram or just put "Harper" in the middle? I'm leaning toward her name. Tonight all the guys in our Sunday School class are getting together (at 3 different houses) to watch the first college football game of the year and do their fantasy football drafts. I'm glad they are having guy nights! We love to have girls nights but it's good for them to hang out as guys. I'm going to do one of two things while I'm home tonight: Weed our flower beds (obviously the fun choice) or start working on a baby book for Harper. What info did you like having included in your baby book(s)? Family trees, how you found out about the baby, Showers, gift list, ........I need ideas. I've been keeping a pregnancy journal so I will try to incorporate some of that in the book. I also want to include all of your comments on my special posts and cards we've recieved. But I need other ideas of what to include. This will be a book I can add and expand so I can keep up with the first few years of her life in here. No matter what you choose to add to her baby book, always keep a Mom Journal! I have journals for both boys. I began each the day I found out I was expecting. I write the entries as letters to each one. I plan to give them to each child on the day they get married. It's fun looking back on all the special moments, not necessarily milestones, but just mom-ments. You will forget the hilarious statement she makes over breakfast one morning, or the crocodile tears that flow when you pick her up from school one day because someone hurt her feelings. Just journal it! Three things that Teresa put in the one she made for me that I thought were really cool are that there was a page with my family's last name and one with his family's last name so I can put special pictures or things from them there. Another cool thing was she made these pages with pockets to hold cards from family and friends.Also, on that first pic on my blog of the page with the box at the top left, she made that for the baby's hand or footprints. We'll take it to the hospital and have them stamp it. Sorry for the novel! Oh and I recognize that bedding! Polka Tot, right? That's where I've been looking too! I love your bedding idea. I can't wait to see it. I don't know how to help with the baby box. I did find a cute one at Monday's Child, here in Fayetteville. I knew you would love polkatot! LOL! That is too sweet! I can't wait to see Harper's room when it is all finished! My advice on the baby book/journal is to write everything down. Don't assume you will remember anything!! This is based on experience, believe me! Love the bedding, it will look really good with the lime green as well! I also think Harper written out would be cute!! Her nursery is going to be so cute!! Harper's bedding will be very sassy and fabulous! I'm not sure you would use this in a baby book because it's more of a scrapbook idea. A friend of mine told me to take a picture of D every month sitting next to the same stuffed animal. She did this with both of her children and it's really neat to see how much they grow throughout their first year. It makes a great collage! D sits on the twin bed in his room next to his giraffe every month. I LOVE being able to look back and see how much he has changed from month to month! Okay...I am so glad you posted this! I am looking for a baby book, too! I don't like any of them or they are $200!!! There used to be the BEST sight online. You did it all online, but I can't find it now...of course! They were beautiful books, but you typed it all into a template and uploaded your pics and Tadah!!! A awesome, easy baby book! Let me know how making it goes. I may have to resort to that too! My mom covers books/photo albums and they are beautiful. But I do not want to have to make all the pages! However, I know if I do not start keeping up with things now, I am never going to go back and do it!!! I love the bedding...I think you should do her monogram. Only because I love monograms! Sorry I was so long winded! The bedding is going to be so cute! What color crib did you get? In Amelia's baby book, I included a picture of our house and wrote the address with it, since it's her first home here. Along with some pictures of some of the stuff outside and her nursery pictures, of course. It's kinda funny to see pictures of the nursery before she got here...while we were waiting for her to be in it! I love Harper's bedding, it is so cute! The lime green will look so adorable. With both of my kids I wrote down all of the cute things they said and did when they were little. I also took tons of pictures. Both of my kids (who are 6 and 11 now) love to look at all the pics I took of them when they were little. CUTE bedding, Kelly! Harper's nursery is going to be beautiful! You MUST include the story of how you chose her name in your baby book. Also fun is a page for hospital visitors to sign, and a page to record all the gifts Harper receives. It's fun for my kids to look back and see who gave them some of the things they still treasure! Have fun tonight. You really should choose the baby book option over pulling weeds. It will be WAY more fun! so beautiful, that is so fun to get the nursery ready and just go in there and pray over her and her future. I would love to caputre those first few days with Harper, but you probably have a friend up there. If not, let me know and I'll be happy to come up. The bedding is going to be gorgeous! Feminine, classy and a little spunky. I love it! Super cute bedding! I say put Harper on the bedding instead of the monogram. And, I have to agree with you mom. Write everything down. Everything! Kelly, something I've done for my girls since the day I found out I was pregnant with them is keep separate journals for each one. I love going back and reading what I've written over the years. I, usually, have to get out a tissue because the tears start to flow. Trust me, they'll never stop, either! Also, on each of their birthdays, I always write them a "birthday letter". In it, I write about their interests, friends/boyfriends, important things that have happened, and I tell I them how much I love them. I keep them in my hope chest and on the day they get married, that will be my special gift to them. Lots of neat ideas here. Each of my children have their own scripture verse and spiritual connotation/Biblical meaning for their name in their books. I also wrote the verses that held significance for me while I was pregnant with them. Do you have "The Name Book" written by Dorothy Astoria? It is incredible. Most of my girlfriends have this book. Harper is in there - it's spiritual connotation is: Instrument of Praise. What a wonderful name! Harper's nursery is going to be so sweet. Thank you so much for your prayers Kelly, they are coveted. God has filled me with a great sense of peace about this whole thing, and I have felt a lot better hearing that so many people find out that nothing is wrong afterall. My doctor never even asked me if we wanted to have the test done, she just did it. Weird. God uses these things to draw us closer to himself, so I am confident that His plan is perfect. The bedding is precious! So fun! I am also on the search for the perfect baby book, so let me know if you find it! That bedding is SO PRECIOUS and just perfect for that sweet Harper-Babe. :) Love it!!! My vote is for her name, not her initials. I always love to see my name on things. Super cute and girly bedding. You are half-way through your pregnancy to meeting your daughter!!!!!!!!!!!!!!!! Thank you so much for your sweet comments on my blog! I LOVE that bedding! Harper is going to be the most stylish baby girl around! :-) And I vote for her name, not just her monogram in the middle. OH, and I think you should definitely work on her baby book tonight. Boo to weed pulling! I am so excited for you...what a wonderful time in your life. i can't find another book like this one that i love so much for the baby i'm due in march with... so making one might just be a good option... i hadn't thought about that! I just blogged about a wonderful guided journal I found called "Love Letters to My Baby" by Vickey Banks. It's not a scrapbook or something you use to keep memorabilia in it (I will scrapbook for those things separately), but this is a book of love letters that you give to your baby one day. It has an amazing array of topics to write about from when you're pregnant, to the homecoming, to being a new mommy. I am loving it and it might spur on some topics you want to write about yourself in the baby book you create. I love that bedding! Are you ordering it online? If so, where? Her room is going to be PRECIOUS! Love the bedding! I can't wait to see what it looks like with the added touches that you will be doing! I think you should put Harper instead of the monogram...either way is cute but I prefer the full name! First of all, love the bedding! One thing I loved in my baby book was at the back there was a page for each month with a space for a picture from that month and a place to write all the milestones and memories of the month. I also keep a seperate journal to write letters to my daughter and I started it the day I found out I was pregnant. I also let my husband write in it - as well as grandparents if they have something special to say but most of the journal contains my letters. I haven't decided if I want to gve it to her on her wedding day or when she becomes a mom herself. I also did the monthly pictures next to a big Teddy Bear I was given. That reminds me: she turned two last week and I haven't taken her two year picture with the bear yet. I did evey month the first year and will do every year until she says, Mooom...this is dorky". LOVE the bedding!!! Can't wait to see it completed!! I LOVE the bedding! It is so beautiful! I like in my son's baby book where it has a space for a letter from mom and dad...to the child. And also I like having places to remember his "firsts"- first word, etc.- because you think you'll remember, but you forget!!!! i would do the monogram..either would be cute..it is such adorable bedding..
i felt the same way about baby books..be careful if you go into a scrapbook store BUT do go..the paper and books are beautiful...you dont have to go full on into scrapbooking but you could use some of the paper or letter stickers to make your own..and ribbon OMG there is so much cute tiny ribbon..i love to use plain spiral type scrapbooks and then ties tons of ribbon on the spine. you might also look at the scrapbook mags and books, they usually have good ideas..just dont get overwhelmed..you dont have to become a scrapper! HAVE FUN!!!!!!!!!!! It is so neat to see you getting to enjoy every momemnt! God is so faithful and good to us. I'm with your mom... Just be sure you write everything down. With Drew I found a great book I liked at Hallmark... and with Em K I bought at great Molly West one that I love. But no matter what you do... Just be sure to record everything the minute they do it! Ha! I saw someone had mentioned an online one, but didn't know the name... I know one of the websites is www.howfasttheygrow.com I have had some friends do there's on there and they are wonderful! 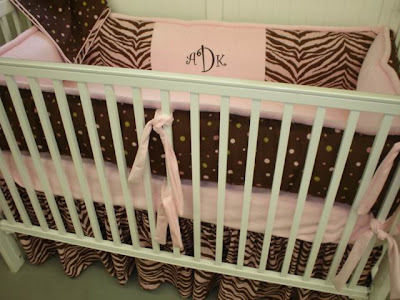 OH MY GOSH I LOVE UR BEDDING CHOICE and the giraffe print will be adorable! I just bought the pink &brown tiger-print and want to do a diaper bag out of it to sell. Would you be interested? If you look on my blog, my diaper bags are on there as well as everything else. The "Graham" diaper bag is the size and style. The bedding is so cute. I think putting her whole name on there is cute!! When my sister was pregnant, I made all these tags and handed them out at the shower for people to add words of advice to my sister and my nephew (for when he is older)...and she put them in her baby book. Maybe you could do something like that. Hi Kelly! What fun bedding! We got the baby book called God Created ME A memory book of baby's first year. We like it but it has tons and tons and tons of spaces for writing :) I'm still not done with it yet! Some of the categories in it that I really like are: where mommy and daddy grew up, how they met, and fell in love, got married. I thought that was so great and fun. Another thing I think is really cute is things that are current: President, popular music, tv shows, big movies, best books, what most people liked to wear (so open with that nowadays :)). Harper's bedding is perfect! I think I would get her name instead of just her monogram too - that'll be cute! As for the baby book - anything in it will be priceless to her! I know from looking back in my baby book I enjoy reading about what was in style and popular the year I was born, what mom and dad did, watched, wore, etc the year I was born, etc. Just fun stuff! i was in the same boat baby book-wise, so i sat down at a book store with several pre-made ones and wrote a list of all the topics/headings i liked. and voila! the perfect baby book for us--i designed it myself with only the "stuff" i thought was relevant. and i of course added other stuff as it tailored to us. I love the bedding! AP's room has chocolatea nd brown in it, too. So warm and inviting. We made our own baby books/scrapbooks, too. That way we could include whatever we wanted, and include other pictures just because we wanted to. You can be much more creative that way. You can also publish your blog (blurb.com) in a book as a way to look back on her first years or your pregnancy. Love the bedding and I think that pop of green will be perfect! I know you are having a blast putting all of this together! Oh, Kelly. I LOVE what you have chosen for Harper's bedding. Gorgeous and precious and adorable! What a precious little room it is going to be! I would put her name on it. Also I second what your mom said: WRITE EVERYTHING DOWN. You think you will never forget it, but trust me, you do! I kept a journal and tried to keep up with my baby books. The second child seems to not have as much written as the first (sorry, Tyler). I think the letters I wrote (inconsistently) to my children is the most meaningful thing I did for them, though. This is something to do after Harper arrives...I scrapbook (about twice a year, not real serious) and I scrapbooked before Luke was born so I saw this in an idea book. Every month on his month birthday, I took his picture in his rocker with the same stuffed animal. Then I scrapbooked them all together. It was amazing to see all his growing. Love her bedding! The pink and brown is so cute. I love you blog! I got connected to you through a friend and have loved reading ever since. I prayed for you and some other girls I know a lot this past year and now two out of the three are expecting!!! God is GREAT! Congrats! On the baby book, we loved having a page of things about how the world was when he was born...the price of gas, milk, diapers, who was president, hit movies, songs and TV shows, fun stuff like that. It is interesting how it has changed in just 20 months, imagine 20 years! We also bought a newpaper from the day he was born. Another great page is a page all about mommy and one for daddy, with your intrests, favorite childhood memories and stuff like that. The bed looks gorgeous! I can't wait to see it with the green. BTW, I loved that my baby books had a letter for the baby on each birthday. I love looking back at those letters I wrote. In the baby book, don't forget to include a spot for the birth certificate, hand & foot prints, the crib card & bracelets from the hospital, your story of coming home, nursery pictures, weight, height & percentile for each month...I could go on & on! :) Best wishes! I love the bedding and I like that you are adding the lime green! I it is going to be adorable!! One thing I wish my baby books had were blank pages, with a title at the top "First times...Funny times". I need more places to just jot down funny things the kids say and do, not really a designated slot for them. Harper is going to be such a stylish little girl!! In my son's baby book I love the part where you put a picture taken on the same day of the month/every month for the first year. It is really neat to look back and see how much he changed during the first year of his life. Thanks again for sharing your blog. I can't help myself - I must put my vote in - I say a monogram! THEN I would hang a painting above her bed with her name on it! hmmmmm . . . I wonder where you could possible find one of those? hehe - super cute bedding! I think Harper monogrammed would be best..I just LOVE that name. Harper is going to have one sassy room! I'm having so much fun watching you put everything together. I had my baby's bedding made and saved all of the receipts from the crib, material, and other things I bought for him. I thought it might be neat for him to see later how things were priced when he was born. I also saved the paper from the day he was born. I have been keeping a feeding schedule for the pediatrician and I think that might be neat to put in there as well. Nothing like putting it in perspective for when the little guy gets older and wants little ones of his own! i would strongly encourage you to check out stats on using a bumper in a crib as this has been proven to not be safe for babies as then can suffocate. it is amazing how many americans use bumpers and know very little about the dangers. in england we do not use these and there is good reason not to. i'm sure it is for decorative reasons as well to use them.